Amos came to the end of his ninth and final life on June 1, 2015. He lived a full life and we will miss him. He always had a baby face, even at 11 years old. 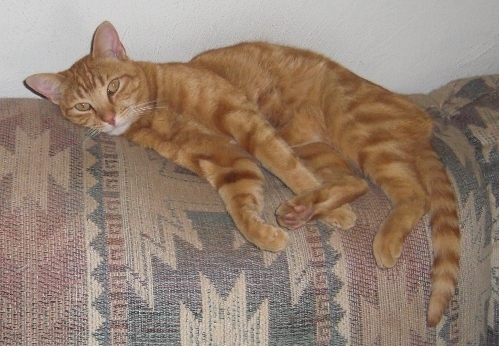 He considered his role to be our ‘guard cat’ – watching from the driveway or under the travel trailer when we were out for the evening, then coming to the front door to announce that he did his job once again. He loved to ‘milk’ (knead) his stuffed cow and our bellies, demanding attention from us only on his terms. Definitely ‘the best cat ever’ is a label that fit him well. I mentioned to Eve how good she has been at picking pets, including Amos, out of a rescue list. She said that, no, they pick us. Amos certainly did. He had a great life with us. We enjoyed his company every day. Truly a gentle, polite kitty.